Sarah Bear Crafts: Finishing Old Projects Time! A lot of cleaning up my stash area involved finding bags filled with old projects. Some half-finished fingerless gloves were sitting in one of those bags, so I finished them up, and made a neck-warmer with the additional thread. 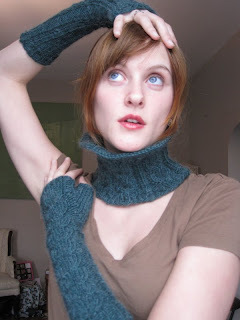 It's not quite a cowl--hardly--but it looks kind of fancy and elegant! It makes every shirt into a turtleneck, even when the shirt doesn't even go up to the neck!